The Office For Housing Enterprise Oversight released its Fourth Quarter 2006 House Price Index (HPI) report (PDF) on March 1. Given the recent gloomy reporting about the industry, you may not know that housing prices nationwide actually went up a bit more in the fourth quarter (1.12%) than they did in the third (1.07%). Though there are certainly problematic metro areas, it would appear that the sky was not falling on home prices. The 5.87% home-price appreciation in the past four quarters is greater than the average of the eight four-quarter numbers reported during 1998 and 1999 (5.03%). In fact, all eight four-quarter numbers during 1998 and 1999 are less than that recorded in 2006's fourth quarter. Three times during 1998 and 1999, quarterly appreciation was lower than the 1.12% recorded in 2006's fourth quarter. 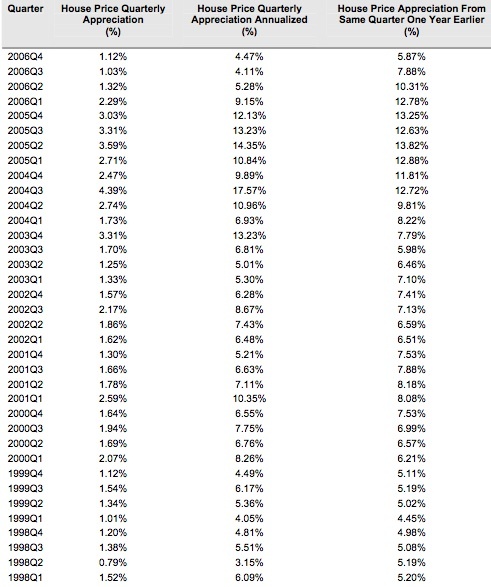 Four-quarter appreciation has been only 1% greater than 2006's fourth quarter six times during the 2000-2003 time period, the latest being the 5.98% recorded in the third quarter of 2003, just 13 quarters ago. Of the 8 regions OFHEO tracks, only one (New England at 2.26%) had full-year home-price appreciation that was less than 2006's inflation of 2.54%. Only one state had a four-quarter housing price decline (Michigan), and only 5 states (MI, MA, OH, IN, MN) had four-quarter appreciation below 2006's inflation. Put another way, the average homeowner in 45 states and the District of Columbia did NOT suffer a real decline in 2006 in his or her investment in their home. Only five states had single quarter declines (CA, HI, ND, NE, and NV); every one except HI (-0.80%) was less than -0.4%. Concerning individual metro areas, this local Tennessee cheerleading link notes that "Of the 282 cities on OFHEO’s list of 'ranked' MSAs, 256 had positive four quarter appreciation, 25 had price declines, and prices were unchanged in one city." A review of the detail indicates that most of the MSA declines are in Midwestern cities tied to the old-line auto industry, and not as much in areas that have been described as "overheated." That is hardly the pervasive housing bust that many in the business press seem to be almost rooting for, or at least expecting almost as an article of faith (particularly the MarketWatch reporter discussed here, here, and here). Perhaps the lack of morbid news explains the relative lack of notice this particular OFHEO report received. Final question: If today's housing market (as opposed to the mortgage-lending industry) is considered problematic, why was it not so in 1998 or 1999?